If you’re a regular shopper of our online used vehicle inventory (the largest in the Durham region), you might have noticed that we tend to keep Nissan Frontiers in stock. That’s because they’re a reliable, tough, and reputable truck. We’ve broken down several different trucks and what they mean about you before, and here’s what we think about the Nissan Frontier. Right now, we have multiple 2018 and 2017 Nissan Frontiers in stock. The reviews on these trucks are consistently positive from both the automotive industry and consumers. The 2017 Nissan Frontier boasts a ranking of 4.8/5 stars on Edmunds. That’s truly incredible! Customers state that the Frontier has a tighter turning radius than its previous editions, as well as a tighter turning radius than other trucks in its class. Beyond that, many cite better-than-advertised gas mileage and comfortable seats which are useful during long road trips and daily commutes. There are a lot of trucks out there that don’t have any more hill climbing capabilities than a Toyota Yaris, and that’s no joke. The Frontier isn’t one of them. It sits on a full-length and fully boxed ladder frame that provides stability and control when you’re driving. While complete with modern and attractive accents, the Frontier isn’t here to show off. Bold design choices with chrome accents make this truck look exactly like what it is: a truck that’s ready for whatever you throw at it. Some used Nissan Frontier units have this feature built in already, and if they don’t it can be added: Nissan’s exclusive Utili-Track Channel system. This sliding box track allows for a multitude of accessories to be added into to bed and used as required. With Utili-Trac, you can separate cargo with ease and confidence. In addition to reliable performance and practical features, the Frontier is convenient. Every model has rear door access, with the King Cab’s doors opening wide. In the back seat you’ll find under-seat storage bins for added cargo space when you need it, as well as a 60/40 split flip-up rear bench. On 2018 Frontiers, you’ll even find 12-volt DC power adapters for charging almost anything. The Pro 4X model is a well-kept secret amongst tradespeople and off-roaders. This truck is powerful and reliable, without the fuss. In circles such as hunters, off-roaders, and serious truck lovers, the truck is known as an incredibly tough and capable vehicle. The Frontier can be used as a work truck during the week and a family-driven functional vehicle all weekend. It is able to tow ATVs and dirtbikes with ease or tackle your next trip to Home Depot without skipping a beat. How does it do it? The 2017 Frontier Pro-4X has a 261 horsepower V6 engine with a five-speed transmission (automatic or manual) and 281 lb-ft of torque, and the base model has 152 horsepower behind a V6 as well. If you’re looking for a truck that can take a beating and get the job done, the Nissan Frontier might be right for you. 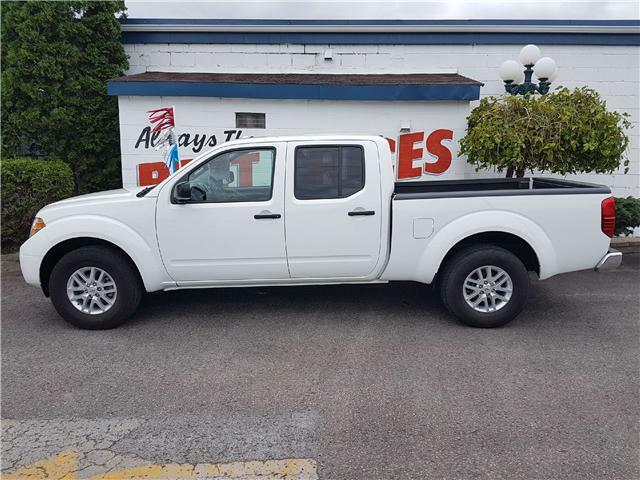 Ready to find your Nissan Frontier or other capable used truck from the home of the cleanest used cars in the Durham Region? Contact Davey Auto Sales or stop by. Our professional sales team would be honoured to help you get into your next ride, where everybody drives.